Imaging Software is available for Win 98, 2000 and XP. Benefit from the latest technological advances in image processing with total compatilibility and full service. Simple, straightforward icons indicate the functions in the Quickvision software, allowing you to easily control your diagnosis imaging workstation and take advantage of all the image processing capabilities: contrast enhancehment, measurements, video-inversion, zoom, filters, psuedo-colors, pseudo-3D and much more. Complete efficiency and optimum profitablity. This technology not only contributes to a quicker, more reliable diagnosis, it also helps you to communicate with the patients by letting you illustrate your diagnosis directly on the screen, helping them to understand and accept it. Includes intraoral camera images and Digital X-Ray images totally interfaced and on a clincial chart of the patient's mouth. The intraoral portion allows input from the digital cameras and all intraoral cameras. The Digital X-Ray module allows input from scanners, sensors and some Digital Panoramic machines. 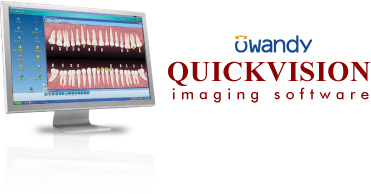 Enjoy all your digital radiography and panoramic advantages thanks to the Quickvision imaging functions – from diagnostic assistance to storage and communication tools. Imaging is controlled using various enhancement tools. Cosmetic module for before and after shots. Bridgeability to most practice management software. DICOM compatible-for image sharing with colleagues. Windows Vista compliant, WIN 98/2000/XP. Integration for intra/extraoral cameras, digital sensors, panoramic machines and scanners.